The Alberta government is making sure affordable housing stays affordable for everyday Albertans by offering housing providers support to upgrade their facilities and lower their emissions. 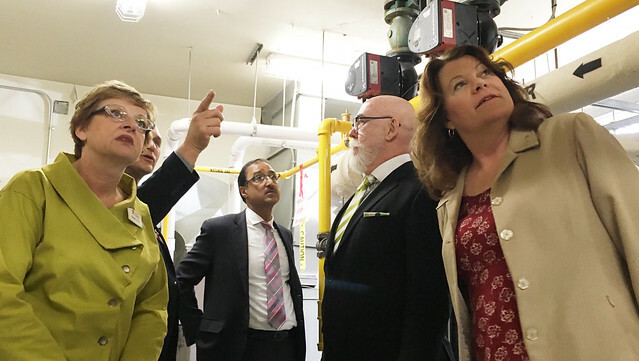 L-R: Karen Lynch, board chair, Greater Edmonton Foundation (GEF), Doug Kitlar, federal Minister Sohi, Scott McKeen, city councillor, Edmonton and Minister Sigurdson admire recent energy efficiency upgrades made by GEF in Groat House Apartments. Minister of Seniors and Housing Lori Sigurdson announced the $25-million investment for housing providers that can be used to upgrade or install windows, basement insulation and energy-efficient heating systems. Budget 2018 allocates funding over three years from the Climate Leadership Plan to make the buildings more environmentally and financially sustainable. This funding includes support from the federal government’s Low Carbon Economy Leadership Fund. The Government of Alberta owns or supports more than 36,000 affordable housing units, home to more than 75,000 Albertans.